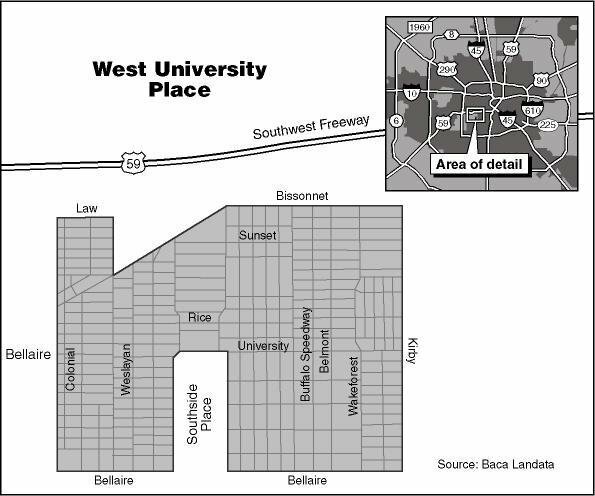 Founded in 1911, West University has approximately 14,200 residents living in 5,600 homes. Well-known for its exemplary schools, beautiful parks and recreational facilities, police and fire departments, and its blue street signs, West University is centrally located and is close to Downtown, the Museum District, Texas Medical Center, the Galleria, the Village, Greenway Plaza, and Rice University. This architecturally diverse community is comprised of brick cottages, stucco and traditional style homes blended harmoniously with French, Georgian, Tudor, Contemporary, and Hill Country style homes. These homes are found among the old oak, maple, and magnolia trees common in the community. Homes range in price from $100,000 to well over $2,000,000. The strict ordinances and deed restrictions of the City of West University Place have helped to protect the city from industrial and commercial development. Additionally, through these ordinances, the City of West University Place has maintained the small-town look and feel that residents love. West University Place has emerged as one of Houston’s most desirable neighborhoods. Architectural diversity, price range and proximity to major areas have improved housing values through the years. This small city has captured the hearts of many with its charm, atmosphere and quality services. Time has proven that the demand for “West U” remains consistently high.